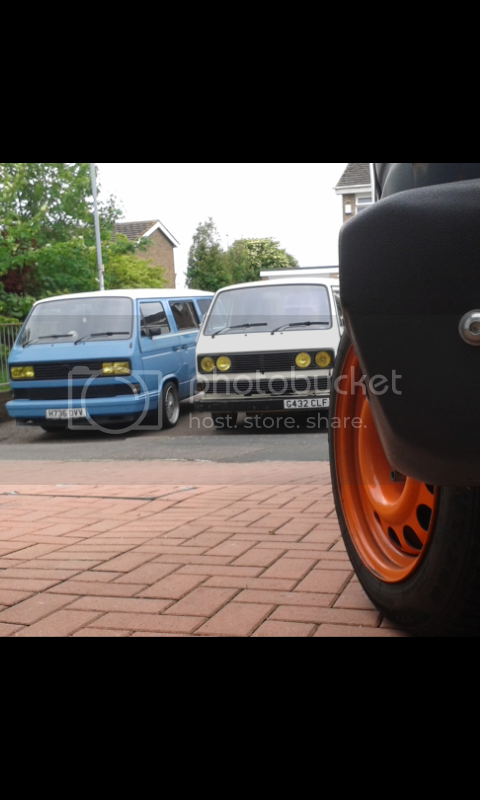 So I'm putting up for sale my baby .. volkswagen T3 autohomes camper. 1.6TD manual. As you can see she is far from basic and standard. I have spent a small fortune on her and it shows. She is a perfect mix of original and updated. Brand new all in the last 12 months.. Custom interior.. all seats..door cards all round..roof lining and carpets. All new custom rubber mate. Table all sanded and revarnishd. All new custom cupboard doors all round. And painted in seriously good quality professional paint. All of the above cost over £4000 alone. Engine is perfect..rebuilt and she drives on point . Gears smooth as you would hope. All new heater matrix rads etc .. I had everything done etc .. all bills .. and a history file 2 inch thick detailing all bills work done since new! You can not believe how well she has been treated. . I had her painted 12 months ago in sage and cream ..looks stunning with the matching interior. New VW moon chrome hubs..
All the cooker..fridge is original and works perfectly . New gas can fitted . She comes with a nesspresso machine..oven ..Brand new cutlery and very expensive crockery. A brand new fiamia bike rack and other essential camping items like folding buckets.. mains lead brand new portaloo ..petrol generstor ..etc etc .. basically you buy and you need to buy nothing to pack up and go exploring. Brand new MOT today and new tyres all round.. the correct tyres . Open to sensible offers . I've got her on eBay for £1195 She owes me more than that. I'm new here and I'm trying to see where I can upload pics?! Hahaha yep I think you might me right! Thank you! Open to sensible offers . I've got her on eBay for £11995 She owes me more than that.